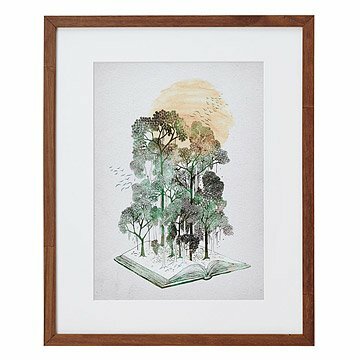 In his lively interpretation of The Jungle Book, David Fleck depicts an open tome covered in a dense forest. Trained as an architect, David Fleck"s illustrations combine the complexity of architectural drawings with the magnificent cities he"s seen throughout the world and in his mind's eye. In his lively interpretation of the jungle book, David depicts an open tome covered in a dense forest of verdant trees that reach skyward toward a golden sun. Hinting at the earthly provenance of all books--from Rudyard Kipling"s literary classic to the humble self-published print--this vivacious art piece is sure to be a potent conversation piece in any space. Designed in Scotland. Printed and framed in Portland, Oregon.